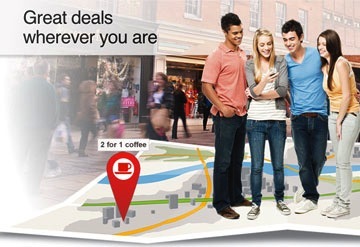 Do you want to create a Successful Location Based Marketing Campaign? Either you are Starbucks digital marketing manager or an agency marketing executive, you have landed at the right airport. 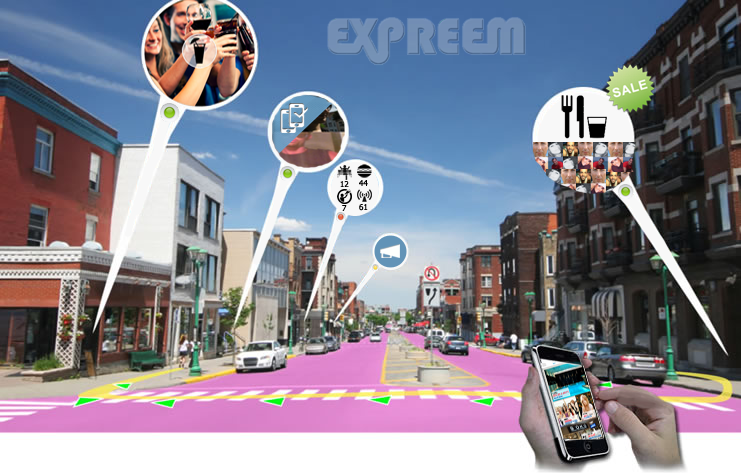 Expreem is the next generation of location-based mobile app that, for the first time, engage with users at the scale that personal interaction actually takes place. You’re for sure not new in the biz and you already know that action and real time interaction, in the LBS app world, is a synonym for business. “Everything is one”…who said it ? Ok, shall I try to be brief? You can have your business ahead of your competitiors in the app that will create a new trend in the location based ADV and attract both new and loyal customers more than ever by surprising them. That was just the appetizer. Before you continue to explore the world of Expreem, take few seconds to download a deck of our mobile marketing solutions within the expreem app, using the password “brands” and send us an email to say ‘Hallo‘. A study published by Forrester warns that while expecting huge returns from marketing via LBS apps, early adopters are prime to take advantage of the medium — using Starbucks recent campaign with Foursquare as a prime example. This is a new tactic in the U.S., this appears to be the strategy behind Ingress. 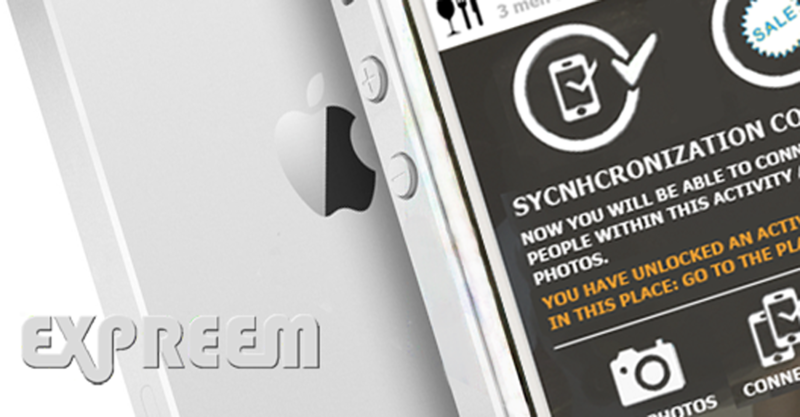 The interaction takes place both in the real world and the virtual world of a user’s mobile phone. The user travels through the game as he or she walks along physical streets. Certain aspects of the interaction require check ins, and the interaction incentivizes journeying to new locations with in-game rewards. In short, it seems to be a kind of mobile-mediated treasure hunt. You’ve Expanded Your Mobile Marketing Budget…. 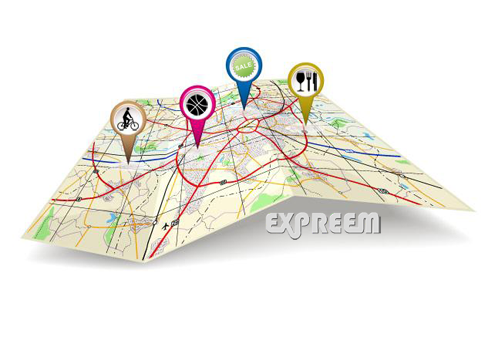 Location-based advertising has long been one of the most hyped promises of GPS technology and the mobile marketing boom. It’s hard not to see why: Imagine a retailer being able to identify when a customer is close to a store and instantly send that customer a custom offer tailored to preferences and purchase history. But so far, the concept hasn’t lived up to billing, primarily because of concerns over consumer privacy and poorly-executed campaigns. But a new study — from Verve Mobile, a niche mobile advertising network — on the use of location-based advertising by restaurants, suggests that marketers are finally catching up. According to the report, which tracked results of over 100 Verve mobile campaigns between January 2012 and March 2013, “casual dining” merchants reported significant increases in click-through rates and sales after deploying location-based ads to nearby consumers. What, specifically, is driving those results? Advertising campaigns that used location data performed twice as well as those that didn’t. Foot traffic to a nearby restaurant more than tripled when location-targeted ads were used. Ads made consumers 20 percent less likely to visit a competing restaurant. Survey participants that used location-specific ads saw a 3 percent increase in click-through rates (compared to the average CTR of 0.1 percent). So what are the broader takeaways for marketers? The consumer mindset is shifting. Consumers are getting more comfortable with the idea of being tracked by marketers — and are increasingly eager to learn about special deals or a new product they can quickly check out. Improved targeting opens up new opportunities. The technology has advanced enough that marketers are getting better at targeting the right ads to the right consumers. This is happening because advertisers are moving away from “geo-fencing” (which involves bombarding users in the same area with the same ad regardless of whether the ad is relevant to the customer) and toward “geo-aware techniques” (which “send different messages to different users based on their position,” according Business Insider). 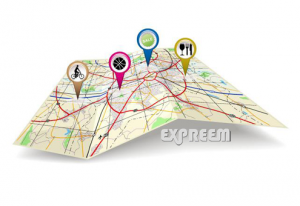 Expreem is among the new players experimenting with new ways to help businesses make the most of location-based advertising. Consistent messaging and experience across channels. It’s the same phenomenon that’s happening throughout digital marketing: brands are getting smart about identifying potential customers and engaging them across all channels — from email to display ads to mobile to social — with messages that they welcome. Not surprisingly, retailers, brands, and agencies are scrambling to hone their location-based approaches. 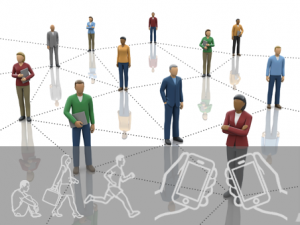 These encompass everything from “geo-aware” and “geo-fenced” ad campaigns, to hyper-local efforts keyed to Wi-Fi hotspots, and algorithmic location-based targeting of audience segments like soccer mums, bargain hunters, coffee enthusiasts, etc. Location-based services offer solutions to two problems that have dogged mobile marketing: the scale problem and the tracking problem. With the help of location data, marketers can identify mobile audience segments at a scale that makes reaching them worthwhile, and they can also target and re-target these audiences. LBS is not simply a mobile strategy, it’s also a way of approaching mobile that has begun to solve one of the industry’s most intractable problems: tracking. The mobile audience has historically been the marketer’s white whale. From a marketer’s perspective, mobile consumers have always seemed evasive, floating just beyond reach. Collecting data has always been difficult because mobile does not support third-party cookies that travel easily across the ecosystem, allowing for straightforward tracking and data-gathering. Not surprisingly, marketers have been eager to adopt LBS, and the dollars are flowing in. A recent survey of 400 brand executives by Balihoo found that 91% planned to increase their investments in location-based marketing campaigns in 2013. Verve Mobile reports that 36% of 2012 mobile marketing campaigns used geo-fencing or geo-aware features, an impressive 19 percentage point increase over 2011. Finally, a study by Berg Insight found that location-enabled ad spend reached about 8% of total mobile ad spend for 2012. This proportion is expected to increase to 33% by 2017. 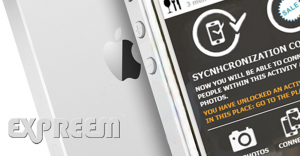 In 2012, Verve Mobile saw an increase in their geo-aware and geo-fenced ads. They went from accounting for 17% of all campaigns in 2011, to 36% in 2012. Geo-aware ads are sort of like personalised ads powered by location data. The message contained in the ad changes based on a user’s positioning. For example, if a user is very close to a car dealership, she may be urged to come in for a specific sale, but if she’s relatively far away, she may simply be educated about the dealer’s inventory. Geo-fenced ads involves targeting all users within a set distance from a business with the same advertising message. DMA (Designated Market Area), City-based, and postal code location-based targeting are variations on the geo-fence. There are 44,000 postal codes — known as zip codes — in the United States, which makes them a fairly fine-tuned, neighbourhood-level targeting tool. DMA (Designated Market Area), City-based, and postal code location-based targeting are variations on the geo-fence. There are 44,000 postal codes — known as zip codes — in the United States, which makes them a fairly fine-tuned, neighbourhood-level targeting tool. Audience: Location data can be paired with anonymous data on demographics, purchase intent, or other behavioural data to reach desirable audience clusters near a given location. Place-based targeting refers to the practice of targeting these audience clusters over a large area, such as nationally, to achieve scale. LBS ad providers tout their ability to target segments like soccer mums at scale with the help of location data. Caution should be used with third-party sources as there’s a great deal of variation in the quality of this data. Place-based targeting refers to the practice of targeting these audience clusters over a large area, such as nationally, to achieve scale. LBS ad providers tout their ability to target segments like soccer mums at scale with the help of location data. If you want to maximize the ROI on your marketing spend, you should understand the differences in the accuracy and quality of the location data you are buying. By asking the right questions of your mobile marketing partners, your mobile campaigns will deliver the results you expect. If you want to boost engagement, think social. People are more likely to buy products when they are recommended by friends and family. In a survey conducted by Market Force, 81% of respondents said that posts from friends influenced their purchasing decisions. Another advantage to social media is that it allows marketers to adapt campaigns quickly. This is a critical capability for targeting consumers in real-time. Some companies are building brand awareness and goodwill by providing LBS in the form of apps, in exchange for data. The History Channel continues to successfully use this tactic. Users who follow the brand on Foursquare receive historical factoids when they check in at tourist destinations. These campaigns are unlikely to translate into revenue in a tangible way, but they do generate buzz. Mobile geofencing, which is sometimes called Geotargeting, is a location-based service (LBS) where layers of location intelligence allow a brand to make decisions or take some action based on a geographical area. As our society becomes increasingly mobile, developers and brands are realizing the added value that mobile geofencing can bring to their LBS marketing campaigns. Creating a geofence for a campaign will allow a brand to tailor promotions to user’s real-time location, increasing marketing redemption rates. People love saving money, and having the ability to acquire, store and redeem coupons directly from a device we all carry around with us everywhere we go is a powerful thing. Recent research shows that consumer interest in mobile coupons continues to grow, giving brands, merchants and marketers a powerful new opportunity to establish and maintain relationships with consumers. There is an explosive growth in mobile coupons, along with some interesting usage stats and predictions. Consider this — a full 20% of smartphone users currently acquire and redeem mobile coupons on a regular basis, with that number expected to grow to 30% by 2013. 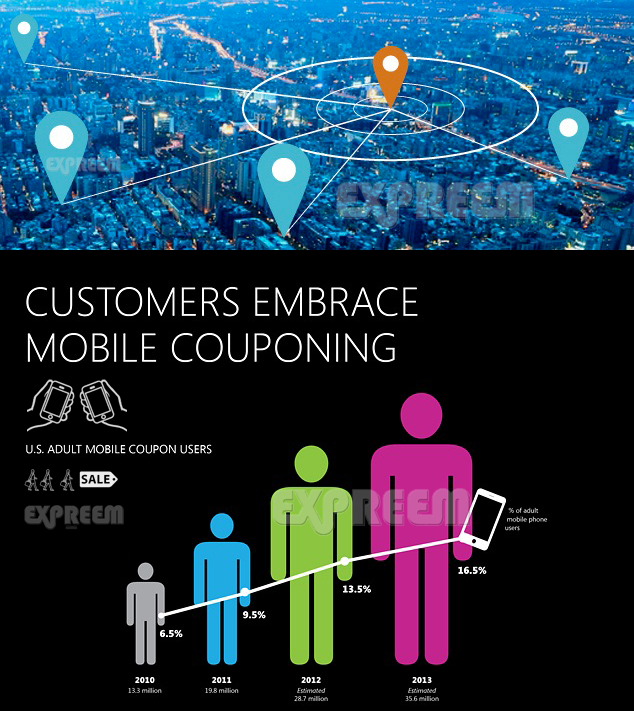 In addition, a full 10% of ALL mobile phone users redeem mobile coupons on a regular basis, growing to 25% by 2014. These are pretty powerful numbers when looking at the big picture, and even more powerful when you look at the engagement rates mobile coupons generate. Nearly 70 percent of all Casual Dining campaigns leveraged location targeting. The biggest consumer brands are fattening up their marketing budgets and adding LBS (Location–Based Services). The possibilities for LBS go way beyond check-ins and store finders. 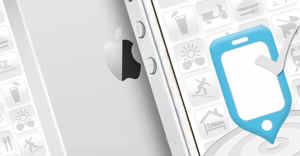 Location is becoming an integral driver of any mobile campaign. Why? Location-based advertising lifts response rates with relevancy. That’s why the mobile ad networks are boasting 5x lifts in CPMs when a lat/long turns a campaign into high click-through rates. Expect to pay hefty premiums for location-based ads over the next three years. Should you pay to play in LBS? You want relevance, you want to reduce spam and annoyance in your customer ranks, you want meaningful click-throughs and mobile purchasing and drive-to-action. All of which means you have to fatten up your mobile marketing budget. Mobile is innovative and effective and, as a result, expensive. The question is how can you cut through the hype and negotiate a good deal on mobile marketing, stand out from the noise and drive the growth of your business all at a high ROI? Get high on smartphones and tablets. There are 1.2 billion smartphones in use worldwide today. It’s not a phone. It’s a computer, camera, browser, shopping assistant, communicator, game platform, wallet, tracker and more. Think beyond your app. While smartphones present a marketer’s dream and endless opportunities to reach out to customers via a device they voluntarily interact with daily, consider this: how is that smartphone or tablet integral to my customers’ lives? And how can I make my brand and products relevant in that relationship? Go deep on relevance. You’ve probably realized that your mobile app and mobile-friendly website is no longer enough. Companies have abysmal download and engagement rates for their apps. Are you offering anything that a customer needs? Or are your just pitching your stuff on a smaller screen? Be relevant. A easy way to create and unlock promotions. Go wide on location. Knowing the location of your message/offer/service is the #1 way to be relevant. Any mobile campaign you’re running without location should be stopped immediately. After you add location, you will double your ROI at a minimum. Location not only enables greater personalization but adds a layer of verification to help prevent fraud and reduce the unnecessary admin costs of many mobile marketing campaigns. And use geofences. Geofencing provides a unique opportunity for you to target your ads at nearby consumers. When a customer enters a set radius, you can push a discount on that customer’s favorite item through your mobile application. Combine the use of geofences with a targeted mobile advertising strategy and you will increase engagement, footfall and ultimately, wallet share. Accuracy depends on a number of factors, including whether the subscribers’ wireless carrier supports the use of A-GPS location capabilities, which are extremely accurate in outdoor environments, to less accurate options for mobile phones that use G-CID, Cell ID and Enhanced Cell IDs, which will produce a mobile geofence location accuracy ranging from one to five city blocks, or 100 – 5,000 meters. So start putting on the LBS. Get high on smartphones and tablets, do deep on relevance, and go wide on location… and start fattening up your mobile marketing ROI. 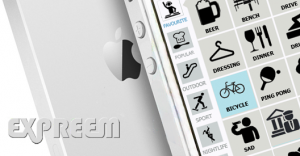 Are you ready to start investing some of your marketing budget on the Expreem app for iphone? First you should understand how expreem works and why it’s so innovative: consider taking a tour HERE. Then you may download some of our pdf documentation HERE and HERE. And then just GET IN TOUCH WITH US for inquires and schedule a meeting with one of our merchant managers. Check here if your city is listed: we are constantly updating the list.